The presence of disability in American public culture is at once increasingly visible and yet still segregated and rendered invisible. In our multi-sited ethnographic research on Disability, Personhood, and “the New Normal” in 21st Century America, we are especially reliant on case studies across the spectrum of disability worlds to help us comprehend how the presence of this category is expanding our understanding of humanity. To understand this uneven process, we have been tracking the presence and absence of disability across sites like schools, labs, families, arts activists, and self-advocacy organizations, both mainstream and obscure, all in New York City. Here, we invoke “the spectrum” in two ways. First, it conveys a sense of our experience of disability in our study as “the broad range of varied but related ideas…which tend to overlap”. Second, it evokes the diagnostic language used to describe the increasing occurrence of a range of complex symptoms controversially classified together as Autism Spectrum Disorder (ASD) (DSM 5). Since our research often involves projects linked to ASD, our title brings together these two sets of associations. As our knowledge of disability worlds deepens, we have come to expect that each case study is revelatory of the emergence of (or resistance to) “the new normal,” standing both for itself and the larger project of redrawing the social map of disability inclusion. Indeed, we encountered the new normal emerging in that most public of spaces: Broadway. Denizens and visitors to New York are probably familiar with the TKTS booth in Times Square that offers steeply discounted theater tickets for day-of performances. It is the public face of The Theater Development Fund (TDF), a well-known non-profit founded in 1968 dedicated to assisting the theatre industry in NYC. Probably less well-known is TDF’s recent vanguard work in making theatrical performances accessible to people with disabilities. TAP (theater accessibility program) offers well-designed accommodations for people with certified vision, hearing, and mobility impairments, including audio description headphones, open captioning, and sign interpreters at selected performances. In 2011, TDF took a step beyond these physical accommodation programs, founding the Autism Theatre Initiative (ATI). 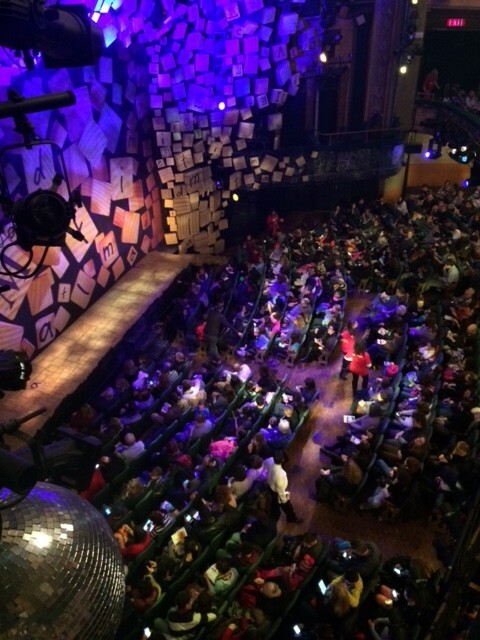 Beginning with performances of Disney’s The Lion King and Mary Poppins, and moving on to Elf matinees, ATI recently offered an autism-friendly performance for older teens and young adults and their supporters for a special matinee of The Curious Incident of the Dog in the Nighttime on November 30, 2014. 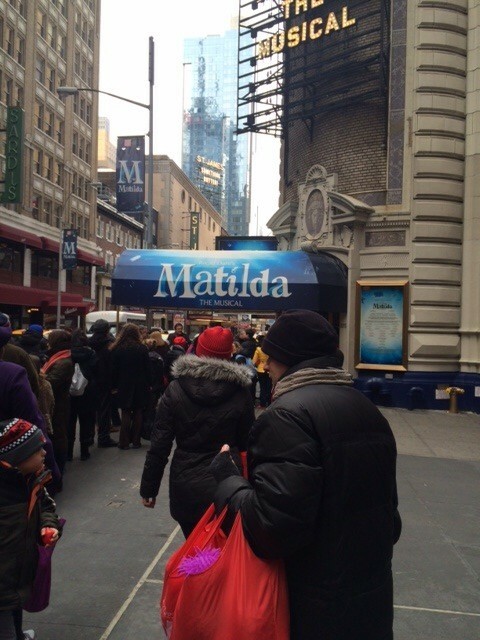 In February, 2015, we joined a group of TDF volunteers in training to help out at the first autism-friendly Broadway performance of the play adaptation of Roald Dahl’s classic children’s book, Matilda, a hit about a preternaturally smart and second-sighted girl who saves herself and her beloved school teacher by unmasking and banishing the bully who runs their school, while also saving herself from a family that has no appreciation of her talents. The play, which has its harrowing moments, is nonetheless filled with talented child performers, creative stage sets, and the triumph of good over evil. In short, this is family fun that pretty much anyone can enjoy, and that underscores the value of being a person who is a bit different, and who has a finely honed sense of right and wrong. This seemed a well-chosen production for the anticipated crowd. But children and adults with autism have often felt excluded from Broadway theaters, and TDF’s ATI set out to remedy these structural barriers. Working with actors, directors, and the large support staff of ushers, salespersons, and attendants, ATI negotiated changes in lighting, sound levels, and audience expectations: the professional staff were taught to expect a different level of noise and movement in Matilda audiences when people with autism were welcomed into the Schubert Theater. Likewise, after unfortunate experiences with local restaurants that had evicted patrons with autism who had gone out to eat after prior performances, ATI worked with nearby eateries to be sure they were autism-friendly, and received staff training on what to expect. They were listed and promoted on a laminated card – along with other items – and given out to families as they entered The Schubert. The day of the performance was cold and crisp; we volunteers dressed in bright red TDF knit hats, with identifying t-shirts under our down coats, and carried bright red swag bags with the TDF logo, filled with the aforementioned restaurant directories, clear guides to who’s who in the cast, and an array of attractive tension-relieving “fidget toys” and earplugs to be given to those waiting to go in. The Schubert Theater is large; it seats almost 1500 people, and virtually all seats were taken for this performance which was for autistic audiences and their families, friends and allies only. As Philip Dallman, ATI coordinator, explained to the forty assembled volunteers during our training, the NYC area has enough people meeting that description to fill a Broadway theater, one of the locational advantages of creating innovative outreach to audiences with disabilities in the City. Ticketholders had to stand outside, as lines were moved in, not an easy wait for anyone. Our job was to make audience members feel welcome as they lined up to enter the theater. These are people who are routinely made to feel out of place and marginal; our directions were to make clear that this experience was going to be different from the minute they spotted the theater. Indeed, there were so many volunteers eagerly greeting arrivals – like so many good spirited red-hatted elves – that we may have been a bit overwhelming. We were given clear instructions, spelled out on the introductory power point, that people we approached may not want to make eye contact, and that though we may find ourselves moved to tears, under no circumstances were we to cry in front of the theatergoers. Five people in white t-shirts, with the word specialist in red letters across the back, had considerable experience working with people with autism; they were available at all times to help in situations that any volunteer could not handle, and we had their cell phone numbers on speed dial. Inside, we helped families to find their seats, and also pointed out the quiet rooms – waiting areas outside bathrooms repurposed for this occasion — on each floor of the theater. Padded floor mats, “fidget toys”, bean bag chairs, and a quiet atmosphere made these popular locations for this crowd having to deal with the sensory overload created by a large crowded theater. In the quiet rooms, anyone overwhelmed by the adjusted sensory assault of the performance was free to take a break at any point; people with autism were encouraged to return to their seats whenever they were ready. We spoke with dozens of volunteers, program coordinators and – of course—families in the audience. 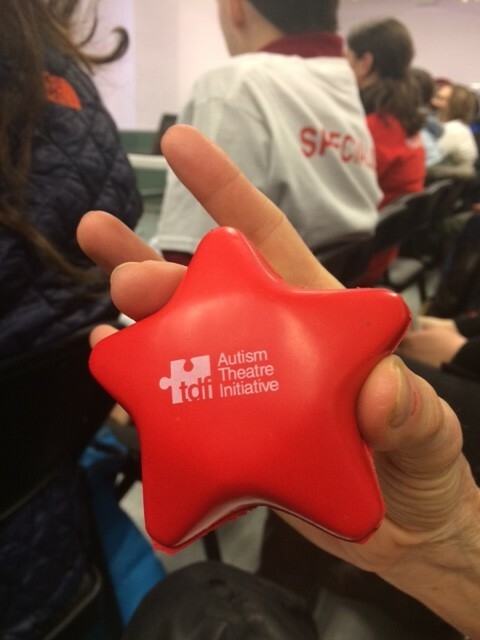 Every volunteer had a story that brought them to the performance, ranging from people with autism themselves, to neuroscientists who had autistic kin, to dancers with special ed interests, to siblings whose autistic brothers and sisters were in the audience, and parents and kids of all ages. Audience members were spellbound by and enthusiastically voluble and unruly about the magic that is Broadway. The performance was brilliantly orchestrated; the actors appeared unruffled by the noise and occasional shouts and nobody flinched when a squeeze toy was hurled upon the stage in Act 1, or a low din rumbled through much of Act 2. Specialists were clearly positioned on every level in case of difficulties. Afterwards, we were part of the brigade that helped to clear the theater efficiently and sympathetically. One Sunday matinee, one instance of an autism-adjusted performance on Broadway. Cui buono? This event engaged many constituencies, we would argue, showing how one case can ramify out into a broad spectrum of public culture. Local restaurateurs learned how to adapt to new clients, theater staff — especially ushers — learned the meaning of “no judgment” (the informal ATI motto), and many people got to enjoy a hugely positive experience often denied to them because of the lack of tolerance for those with autism who are judged as inappropriate and disruptive in many public venues. Beyond this eye-opening, moving, and joyful day, TDF proclaims itself the greatest beneficiary: “We don’t just want everyone who participates to have a great day, we want to build new audiences for the future”, as Dallman enthusiastically put it during our training. Moreover, the ATI is part of a broader movement for changing the face of American public culture, part of the remarkable, longstanding Museums Access Consortium (MAC) of NYC, a volunteer-based association that brings together cultural practitioners, people with disabilities, and disability advocates to share experiences, learn from one another, and refine best practices with the aim of advancing accessibility and inclusion in cultural facilities of all types in the New York metro area. Our “fieldwork on the spectrum” attends to the growing transformation of American public culture. Everyone involved, from toilet attendants to Broadway stars, from restaurant wait staff to families enjoying a relatively unstressed outing, experienced what inclusion of life with a difference might be like if the aspirations, rights, and accommodations needed to include a wide range of people with disabilities are really in place. After all, 2015 marks a quarter century since the passage of the Americans with Disabilities Act. Think about how rarely you see the audiences we are describing next time you go to the theater, the museum, or the movies. Groups like ATI and MAC are in the business of changing that. We were privileged to witness one extraordinary afternoon, one case among many in slow but steady transformation. It’s about time. Faye Ginsburg and Rayna Rapp (aka Fanya Rappburg when writing together), are both faculty members in the Department of Anthropology at New York University. Since 2007, they have been carrying out research on cognitive disability and cultural innovation, with an ethnographic focus on New York City. Based on that work, they are currently writing a book together entitled Disability, Personhood, and the “New Normal” in the 21st Century with the support of an NEH Collaborative Grant. They are both active in the NYU Council for the Study of Disability which they founded in 2006. At NYU, Faye Ginsburg is Director of the Center for Media, Culture and History and Rayna Rapp is Associate Chair and core faculty for the departmental program in Science Studies/Medical Anthropology. The case image comes from the Autism Theater Initiative, a project of the Theater Development Fund. All other pictures are by the authors. Ginsburg F, Rapp R. No Judgments: Fieldwork on the Spectrum. Somatosphere. 2015. Available at: http://somatosphere.net/2015/no-judgments-fieldwork-on-the-spectrum.html/. Accessed April 18, 2019. Ginsburg, Faye and Rayna Rapp. 2015. No Judgments: Fieldwork on the Spectrum. Somatosphere. http://somatosphere.net/2015/no-judgments-fieldwork-on-the-spectrum.html/ (accessed April 18, 2019).